A year ago, Coca-Cola teamed up with Spotify for what it described as a global marketing partnership, and last fall Coke participated in a $100 million financing round for Spotify. 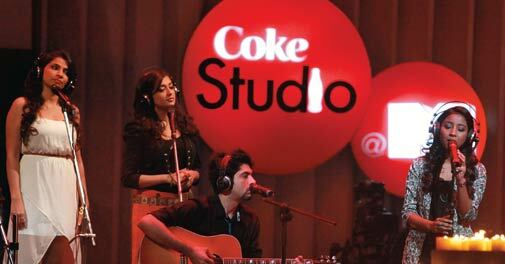 But when it comes to India, Spotify is not the only music service on Coke’s mind. Earlier this year, Coca-Cola India worked with Dhingana, a streaming service that specializes in Bollywood and other Indian music, to promote songs from its “Crazy for Happiness” advertising campaign. Spotify is in 28 markets, but not yet in India. In a promotion that would be unusual for American services, Dhigana not only highlighted the songs from Coke’s “Khushiyaan Lutao Crazy Kehlao” album on its Web site, but also pushed them to mobile users through notifications, alerting them to the songs whether the users wanted to hear them or not. Maybe it was part of the pay-it-forward message of the ads, which celebrate kindness to strangers through unexpected high-fives -- and, of course, the sharing of a Coke with a security guard or Santa Claus. These promotions reached about 1.4 million people in three days during an unspecified period in the first quarter of the year, Dhingana announced late Tuesday — 760,000 of them on Apple devices and 620,000 on Android, a ratio that may point to many Dhingana users beyond India, where Android use far exceeds that of iPhones. Dhingana, which has offices in India and Sunnyvale, Calif., says it has “millions of users in more than 220 countries,” although it offers no specifics. Crazy kindness may have a low level of virality, however: despite the 1.4 million digital nudges, only 38,374 people actually listened to the songs, Dhingana and Coke India reported. A spokeswoman for Coca-Cola in the United States did not have a comment about the campaign on Tuesday, and a spokesman for Spotify did not immediately respond.